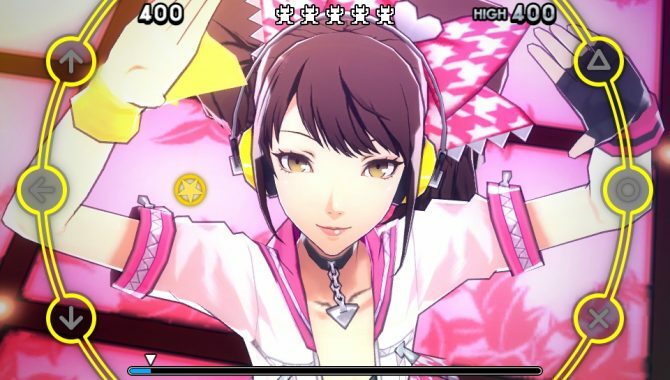 Persona 4: Dancing All Night breaks new ground for Atlus?s internationally popular Persona series. 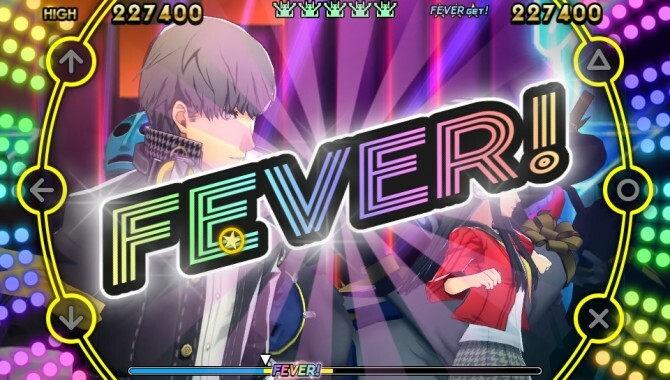 After wrapping up mysteries in sweet JRPG style in Persona 4 and then delighting fighting fans with the Persona 4: Arena games, the Persona 4 cast now straps on their dancing shoes to try and win the hearts of rhythm game fans. 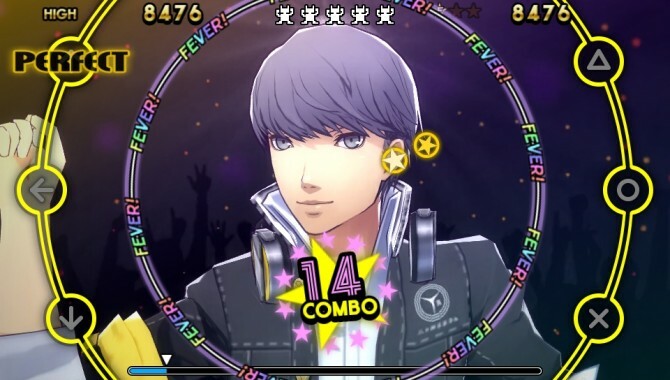 Based on the mechanics of the rhythm gameplay, Dancing All Night doesn?t do anything truly groundbreaking, but it distinguishes itself from other titles in the genre the same way Persona 4: Arena boldly distinguished itself from other fighting games: with its story. This is very likely the most fully realized story to appear in any rhythm game ever. More foulness is amiss in Inaba as our memorable, colorful cast of high schoolers prepares for a special concert in which they?ll assist Risette with her comeback. The central themes of the story are bonds or the connections between people (replacing the social links of other entries) and the true self; the self within the mask we wear to benefit and please those around us. The story is told in a visual novel style, with full voice acting (no Japanese audio, unfortunately), clean artwork and lots of dialogue. There?s plenty of humor as expected and it feels like you?re just hanging out again with the same group of quirky, lovable friends. 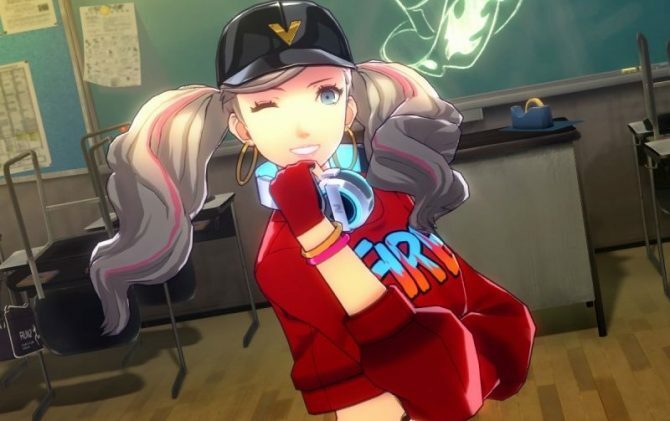 Several new characters are introduced and although it all concludes rather swiftly — especially compared to the main series Persona RPGs — it ends up being heartwarming and entertaining, primarily if you?re already fans of these characters. 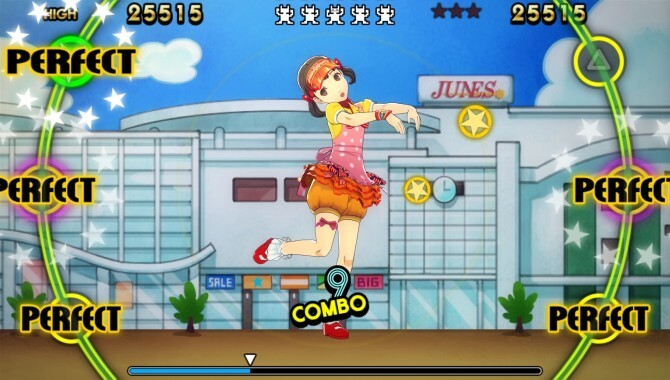 The gameplay is basic rhythm gamefare: tap the buttons in time with the icons on screen. 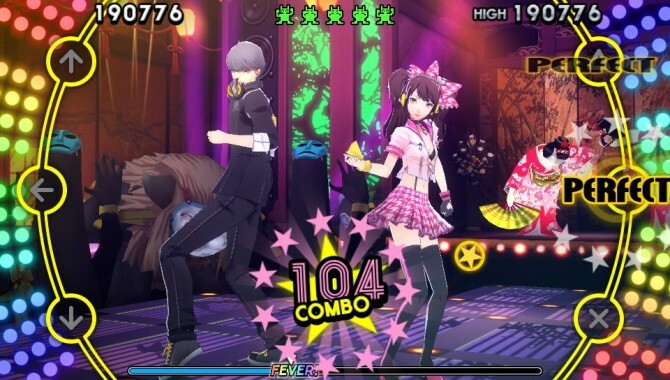 Compared to Project Diva, Dancing All Night is very forgiving and easy. You interact with the D-pad, face buttons and analog sticks, never needing to use the shoulder buttons or touch screens. You can hit notes with levels of accuracy ranging between perfect, great, good and missing the note altogether. Hitting long strings of notes will result in chains that increase your score faster but only perfect or great notes count towards a chain and hitting a good note will break your combo. This is probably because you can get good on the notes by pressing the button as early as you like. You use the analog to hit fever rings which move you closer to unleashing fever mode. Hitting the fever rings will build your chain as well, but missing them will not break your chain. Also, there is no penalty for simply pressing a button so you could literally mash the buttons and get good on most notes, easily clearing the songs. Doesn?t that seem so forgiving? Once you?ve done well enough you will enter a special fever mode. Cool stuff happens on screen but more importantly, good notes are counted towards chains during fever mode. I definitely did feel that a bit more could have been done to spice up the rhythm gameplay, however. For example, little or nothing happens when you miss a note. Behind the button cues the characters execute dance various routines, so maybe missing the notes could cause them to fumble or trip over a dance move. Sometimes the characters drop an obligatory ?aww man? or something like that but there is really no reason to be worried about missing a note. The game has four difficulty settings, one of which is hidden. 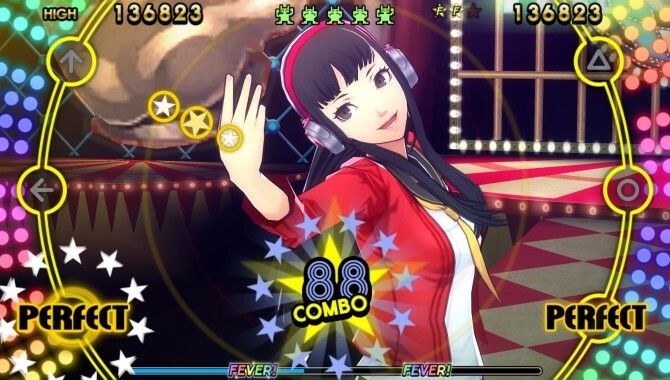 The easy setting, which is recommended for those who just want to enjoy the game?s story or aren?t that into rhythm games, is truly Very Easy. You will need to hit only a few notes throughout the duration of the song. Normal is more challenging and is perhaps my preferred mode while the latter two settings should be reserved for those who fancy themselves good or skilled at these kinds of games. The game?s soundtrack is really quite good. 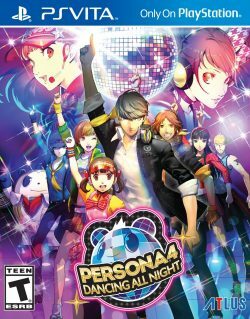 There are songs from Persona 4, Persona Q, Persona 4: Golden and more, as well as some original tracks created for this title. Of the tracks included, most of the older ones have been remixed into different songs altogether. Anyone who is already big into Japanese EDM will recognize superstars like Shinichi Osawa and Towa Tei credited on different remixes. There?s really a considerable amount of variety in the soundtrack and fans will enjoy the nostalgia of some tracks, as well the fresh spin put on others with the remixes. There don?t seem to be multiple endings or anything you could miss, so once you clear the game?s story mode the only place left to go is the free dance mode. As you play the title you?ll earn currency which you can use to buy stuff in the game?s shop. 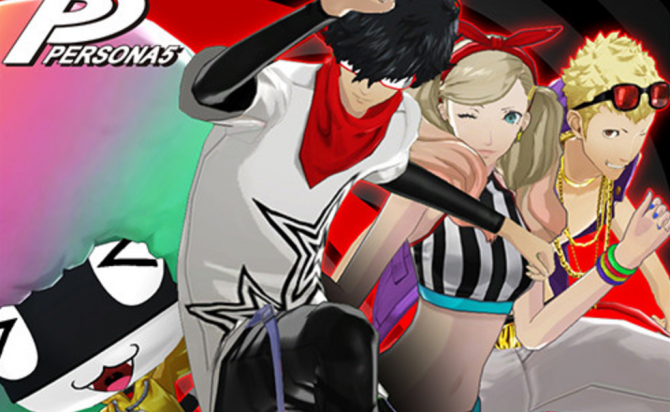 There are different costumes and accessories you can use to deck out the characters for free dance mode. Of course if you?re not happy with the considerable selection available in the game, you can add more via premium DLC that is already available. This is also true for the game?s list of tracks and the DLC tracks, which are about $1 apiece. From the in game shop you can also purchase various items which spice up the gameplay. For example, one item makes good notes count as part of chains, effectively unleashing a non-stop fever, although using it does reduce your total score. There?s a gallery mode, in which you can view all the lovely illustrations you unlocked in story mode, character models, your scores on various stages and more. There are also medals and other things you can unlock, to satisfy the completionist within you. The sound player has a neat jukebox feature which will definitely see lot of use when you want to hear one of the cool remixes but perhaps don?t quite feel like playing through the song. 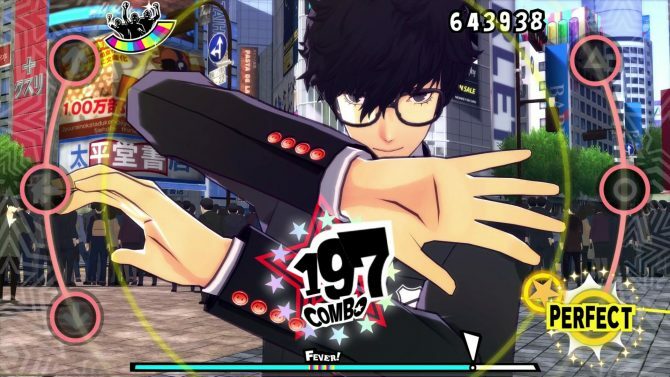 All in all this is definitely a package that should be appreciated by fans of Persona, of rhythm games and especially fans of both. 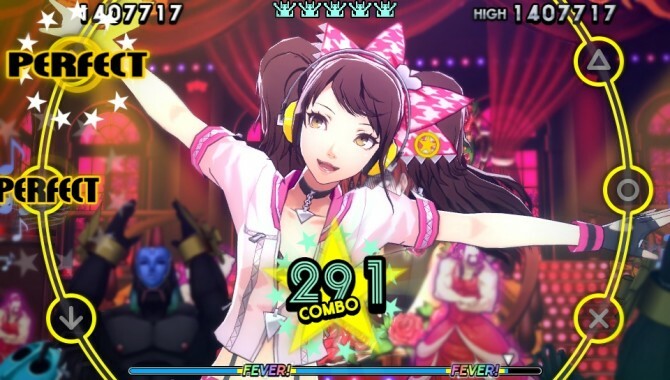 Although it seems to lack the production value and spectacle of the genre?s heavy hitting Project Diva series, Persona 4: Dancing All Night makes up for that with narrative substance, use of an IP already adored by millions and a soundtrack that has something for everybody, all topped with a certain polish unique to Atlus and the Persona series.